There have been various reports over recent weeks concerning some EVGA GTX 1080 and 1070 cards overheating. In particular it was noted by Guru3D, that the VRM component areas of EVGA FTW and SC cards were "getting seriously hot," when taxed. It noticed the phenomena when stressing these cards with a looped 3DMark FireStrike sequence. EVGA initially blamed people testing their cards with the FurMark Benchmark. Nevertheless it began to issue thermal pads for users to add to their toasty graphics cards – affected users could request these pads and get them for free. Guru3D explained that EVGA had skipped the installation of thermal pads to aid heat dissipation of the VRM area "to keep down production costs". 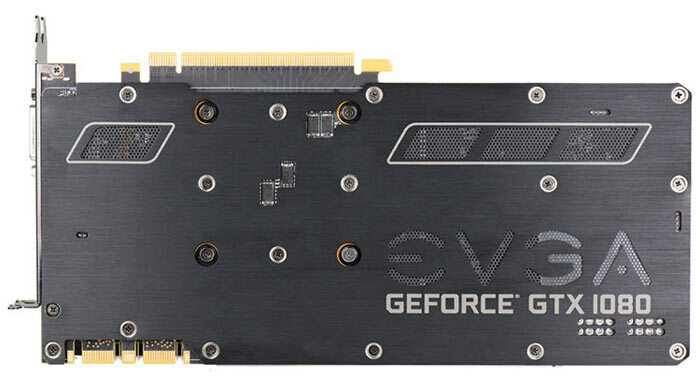 Now EVGA has come out with an explanatory statement and more measures for owners of its graphics cards suffering from overheating. First of all EVGA is maintaining the availability of thermal pads "free of charge to any customer who is interested". Secondly, EVGA is issuing a VBIOS update to "adjust the fan-speed curve to ensure sufficient cooling of all components across all operating temperatures." In other words, your fans will spin faster and louder to reduce the likelihood of component overheating. While initial reports of overheating issues concentrated on a handful of EVGA graphics cards it seems like many more could be affected. In its statement EVGA lists all its ACX3.0 cooler cards and adds that only the "Founders Edition, Blower type, HYBRID, and HYDRO COPPER cards do not need these updates". See the table above for VBIOS and thermal pad update support eligibility. EVGA promises to honour warranties of cards damaged by overheating or during user installation of the optional thermal pads. Furthermore, users who are overwhelmed by the possibility of doing a VBIOS update can use the EVGA advanced RMA process to get a replacement card with new VBIOS installed. Interesting article. EVGA are potentially at the top of my list for the GPU in my new PC, however as one of my main criteria is noise (and these new fan speeds will create more of it) I can no longer trust any of the reviews currently out there. I have a 1070 FTW, and this was the first I knew of this issue, so thanks for highlighting it! I must admit I have been very impressed with the noise under load, so it will be interesting to see what these new fan profiles will be like. I will also get the thermal pads as well just to be safe. It is disappointing they tried to save costs by neglecting them, but at least they are helpful in addressing the issue; once exposed and cornered! Pretty much talked a friend into an EVGA 1080 because they have always been good for me. Feel a bit crap now. I have an EVGA 1070 FTW and like pretty much every graphics card that I've ever bought, I always set a more aggressive fan curve in Afterburner. EVGA's stock fan curve is WAY to passive for my liking. Fan doesn't kick in till 60C and by 70C it's only spinning at 30%! The fans on the ACX3.0 cooler are pretty much inaudible up to 60% (and that's with the side panel off). So Mine passive up to 30C, then ramps up to 50% at 60C, then up to 70% at 70C and then onto a 100%. In game temps are usually around high 50's to low 60's using this. And with ACX3.0 fans only spinning around 50%, I'll be damned if I can here then over my case fans (quiet gentle typhoons). I'll be interested to see what EVGA's amended stock fan curve looks like. Be interested to see where HEXUS have seen an official comment that that they will replace cards under warranty if a customer damages their card when fitting the ”optional“ (ha) thermal pads. Maybe I've just missed this official statement. PS. I'll still be fitting the ”optional“ (ha) thermal pads on the VRMs when they turn up. And as far as I'm aware, these wont start shipping till next week at the earliest. PPS. I'd be amazed if EVGA ”missed" the thermal pads on these cards to save money. Surely the cost saving would be minuscule. I personally think they just thought that they didn't need them.